Once the Archdiocese learned about the allegation, they removed him from ministry. WASHINGTON -- A D.C. priest has been arrested and charged with second degree Child Sexual Abuse. 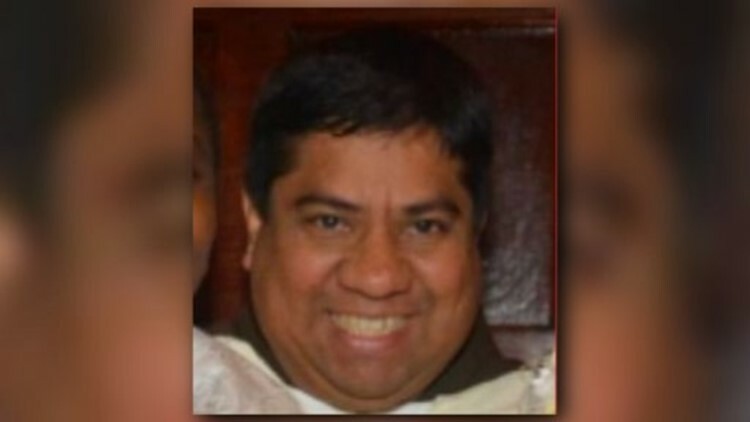 The priest has been identified as 46-year-old Urbano Vazquez. He was a parochial vicar at the Shrine of the Sacred Heart in Northeast, D.C.
Police say he is accused of having sexual contact with a child in 2015. They did the same for the pastor of Sacred Heart and placed the parish's child protection coordinator on administrative leave. "The Archdiocese of Washington is steadfastly committed to the protection of youth and the healing of those harmed by abuse and adheres to a zero-tolerance policy for credible claims of abuse made against archdiocesan clergy, religious orders operating in the archdiocese, staff and volunteers. On Friday, October 26, the Order of Friars Minor Capuchin (OFM Cap. ), which for many years has overseen the pastoral ministry and governance of Shrine of the Sacred Heart parish in Washington, informed the archdiocese that it had received an allegation of sexual abuse against Father Urbano Vazquez, OFM, Cap. The allegation was also reported to the D.C. Metropolitan Police. Father Vazquez has served as parochial vicar at Sacred Heart since 2014. This was the first report to the Archdiocese of this allegation of sexual abuse and immediately upon learning of this serious allegation, the Archdiocese immediately removed Father Vazquez from ministry and suspended his priestly faculties. Since the initial claim to police, additional allegations against Father Vazquez were reported. The Archdiocese of Washington takes seriously its responsibility to protect the children entrusted to its care. The Child Protection Policy of the Archdiocese of Washington mandates criminal background checks, applications and education for all employees and volunteers who work with young people. In this case, Father Vazquez cleared the background check and accompanying requirements. In reviewing this troubling matter, the Archdiocese subsequently determined that Father Moises Villalta, OFM Cap., pastor of Sacred Heart, failed to follow appropriate protocols related to reporting allegations of abuse to civil authorities and the Archdiocese of Washington. Father Villalta has been removed as pastor. For similar reasons, the parish’s child protection coordinator has been placed on administrative leave. The Archdiocese follows a zero-tolerance policy for child protection matters, and the actions taken in this case are in line with such a policy. The archdiocese is fully cooperating in this investigation and encourages anyone with information that may be helpful to the authorities to contact Detective Eric Walsh, Youth and Family Services Division, Physical and Sexual Abuse Unit of the Metropolitan Police Department at 202-568-1971. If at any time individuals become aware of improper conduct by a person involved in archdiocesan ministry, they are encouraged to contact Courtney Chase, Executive Director of the archdiocese’s Office of Child Protection and Safe Environment at 301-853-5302."